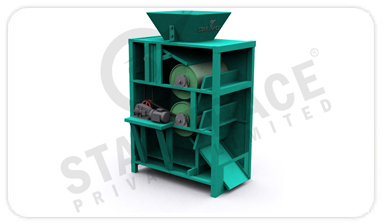 STAR TRACE Industrial Magnetic Drum Separators are primarily designed and manufactured as low field intensity separators. They have an open magnetic system with the magnetic poles located in one plain. Low field intensity separators are employed for separating iron particles from bulk material whenever foreign iron disturbs the subsequent process sequences. It is also used for removing or enriching strongly magnetic content of dry minerals. After the ore slurry tank into the tank after the water pipe water to the mine under the influence of mineral particles into the tank was loose state of a mine. The role of the magnetic field, magnetic mineral particles to the magnetic pole movement magnetic agglomeration occurs, and be attracted to the cylinder. The polarity of the magnetic poles along the alternating direction of cylinder rotation, and at work be fixed, due to alternating magnetic pole magnetic stirring produced the phenomenon of non-magnetic minerals in the turning off, and eventually the suction surface of the cylinder is a concentrate. Concentrate along the edge of magnetic cylinder to the weakest at the magnetic system, mineral water spray in the unloading effect of flushing water was discharged into the concentrate tank, if it is full magnetic magnetic roller, brush roll unloading ore is carried out with . Non-magnetic or weakly magnetic minerals are left with the pulp slurry in the discharge groove, that is tailings. Permanent Magnetic Drum Separators mainly by the cylinder, roller, brush roller, magnetic system, tank, transmission parts 6 parts. Cylinder by a 2-3mm stainless steel plate welded into the tube, end caps for the aluminum casting or workpiece, connected with stainless steel screws and barrel. Motor or directly through the reducer Promise speed motor, drive cylinder, magnetic roller and the brush roll for rotational movement. Magnetic system is an open magnetic system, mounted on the cylinder and exposed full magnetic. Magnets with stainless steel bolts installed in the magnetic yoke of the floor, out of cylinder yoke shaft, the shaft has Shui arm fixed. Pulled the magnetic system can be adjusted Shui arm angle adjustment lever can be fixed after appropriate. Tank work area with stainless steel plate, frame and other parts of the tank with ordinary steel welding. Industrial Magnetic Drum Separators are primarily designed and manufactured as low field intensity separators. They have an open magnetic system with the magnetic poles located in one plain. Low field intensity separators are employed for separating iron particles from bulk material whenever foreign iron disturbs the subsequent process sequences. It is also used for removing or enriching strongly magnetic content of dry minerals. The most widely used application of industrial magnetic drum separators is by deflection separation in which the bulk material is fed onto the top of the drum. This must be spread evenly over the entire width in order to ensure optimum utilisation of the drum. The use of a vibratory feeder is appropriate for feeding the material tangentially onto the drum. This operating procedure ensures minimum wear to the outer drum and guarantees constant-speed application. At normal feed speed of 0.2-0.3 m/sec. using vibratory feeders, the material is spread and distributed quickly over the drum, which rotates at a speed of 0.6-0.8 m/sec. The material is reduced to 1/3 - 1/4 of the feed layer height. On permanent industrial magnetic drum separators rectangular magnetic blocks generally made of sintered hard ferites are radially magnetized and mounted on a soft iron plate. The magnetic drum is connected to a rigidly fixed shaft, the position of which is adjustable. The outer drum made of high-grade steel or manganese steel rotates around the axis supported on roller bearings. Highest grades of magnetic material including Neodymium-Iron-Boron (rare earth), Samarium-Cobalt (rare earth), Ceramic and Alnico. Dust tight 304 stainless steel housing construction. 1/4" x 2" x 2" angle iron inlet and outlet flanges. Access door for inspection and maintenance. Adjustable feed gate to meter product flow. Adjustable magnet positioning for optimum separation. Continuous cleaning discharges ferrous contaminants separate from product flow. Inlet has a fixed diverter to direct product flow over magnet. Outlet has splitter for ferrous and non-ferrous product discharge. The totally enclosed type drum comes complete with a chute type feeder, hopper, adjustable feed regulation gate, magnetic drum and geared motor drive in a ready for use condition. Inlet and Outlet openings are flanged for ease of connection to customers duck work. Double or Triple totally enclosed machines can also be supplied if required by clients. STAR TRACE's Wet Permanent Magnetic Separators are offered in size of dia 1200mm(48') and 916mm(36'W) ion lengths of upto 3000mm(10'). Three basic separator designs are available for copping, roughing and finishing/cleaning applications. Each type can be supplied in single drum or multiple drum stages of taconite or magnetic and also for recovery for magnetic medium in dense media plants. The stationery magnet yoke is an assembly of Rare Earth Neodymium Permanent Magnets. 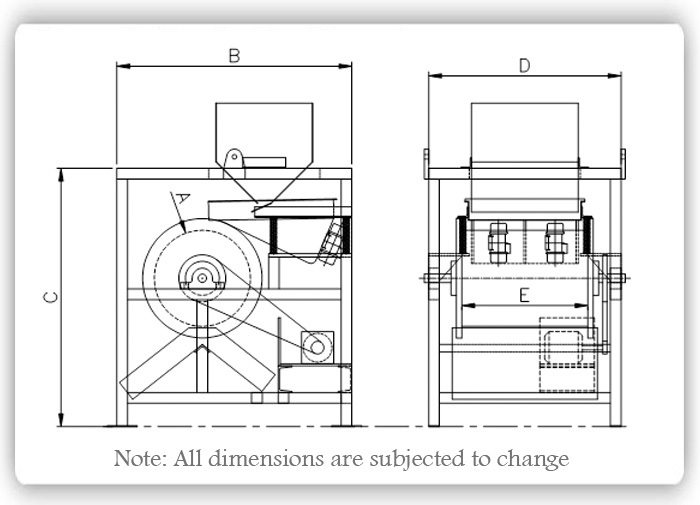 The rotating drum is available with optional rubber or stainless covers. The magnetic flux pattern will match the tank configuration for optimum performance. Most economical automatic iron removing equipment for large volume for dry powders, granules & crushed materials. Suitable for any dry material. Remove fine iron particles and iron oxides from mixed materials. Glass, pharmaceuticals, cement, metal recovery and plastic industries. The permanent-magnetic roller separators are used in mines and coal separating factories to separate the wet fine highly magnetic substances or remove the highly magnetic substances from the non-magnetic materials. Half Counter current Tank (CTB). which are used according to different granular and technological requirements. The features of our products are: optimized computer design, rational magnetic circuit, strong magnetic coercive force and high-remanence permanent magnet which can keep the magnet performance in a long period and safe guard the long-term interest of the customers, which makes the whole structure is reliable. Powerful magnetic zone approximately of 135 Deg fixed inside rotating SS Drum. Material is fed from hopper/tray on drum, tramp iron is held on drum and non magnetic material falls, iron is taken away held by magnet and then falls when away from magnet zone. Magnet Drum is supplied with fixing blocks and Shaft for adjustment. Complete Drum Separator machine is supplied with hopper, vibrating feeding tray and gear/motor assembly. Available in Single / double and triple drum complete unit. Made with Strontium ferrite magnets. Electro Magnetic drums are made using Aluminum or Copper conductors. Enhanced separation compared to equipment such as Magnetic Pulleys. Different magnet configurations available suited to individual needs. Drum housing can be designed to suit space limitations. Wide range of Drum diameters and widths available.